If you are planning a saltwater fishing trip in South Florida, a great way to increase your chances of filling your limit is by using live and frozen bait. Today we are going to take a look at some of the most popular saltwater fishing bait that you can find in South Florida. So if you are going fishing this weekend, make sure to include some of these in your tackle box. 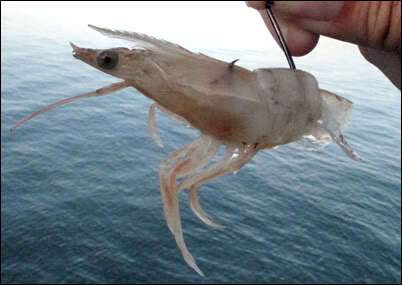 One of the most widely used baits in South Florida is shrimp. Used live or dead shrimp will attract many different types of fish. Great for fishing on the bottom or with a jig, you really can’t go wrong with shrimp. Another very common fishing bait that saltwater anglers use in this area of Florida are crabs. These crustaceans are used to catch several kinds of fish including black drum and redfish. Crabs can be kept for many hours during your fishing trip in your live well. These fish are used as cut bait and many fishermen troll with them. Sailfish, tuna, dolphin and wahoo are all attracted to ballyhoo making them the perfect bait for larger saltwater fish. Most professional anglers in South Florida use squid as bait every time they go out. Squid is easy to find in this area and can be used both during inshore and offshore fishing trips. Fresh or frozen squid is easy to store and you will attract fish such as redfish, bluefish, and striped bass. If you are not familiar with saltwater fishing, then you have probably never heard of sand fleas before. But these ocean-dwelling creatures make the perfect bait. Sand fleas are actually tiny crustaceans that live in the sand along coastal waterways and beaches. Sand fleas are the perfect bait for those anglers who love to fish the surf. Clams are also used for bait along Florida’s coast and are effective in catching dozens of different types of fish. While clams are harder to keep fresh they tend to stay on the hook longer than any other type of live bait. This is why so many anglers love to use clams for bait.